Wondering which human foods are safe for dogs and which ones are not? Here are the foods to AVOID giving to your dog (human foods that are poisonous to dogs), as well as those which are OK for pets (human foods that make great dog treats). Plus, what you should know if you decide to offer table scraps and other people foods to your dog. Who Gives Dogs Human Foods? But generally speaking, most people stick to serving dog foods to their pets day in and day out. Of those pet owners who choose to give their dogs human foods, many reserve it for special occasions (holidays like Thanksgiving, Christmas, or maybe your dog’s birthday) or times when you’re nursing a sick pet back to health. Due in part to the increased popularity of Kong toys, more and more pet owners are also choosing to supplement their dog’s diet with a variety of human foods that are given as “treats”. Of course, there are some people who are dead set against giving dogs human foods and they think it is completely inappropriate to do so. Others refrain from giving their pets store bought dog food altogether, and choose instead to include only all-natural human foods in their dog’s diet or even a raw food diet for dogs. Whatever your views are on dog diets in general, I think it’s safe to say that your dog will ingest at least one human food at some point in time — either with your knowledge (as a regular diet, or as table scraps or dog treats) or without your knowledge (maybe from the garbage, or given to your pet by someone else). Which human foods are safe for dogs to eat? What do I need to know if I decide to give my dog foods that were originally intended for people? You should always consult with a veterinarian before introducing your dog to any new food item. Just because someone else’s dog didn’t have an adverse reaction to a particular human food doesn’t mean that your pet will behave the same way. 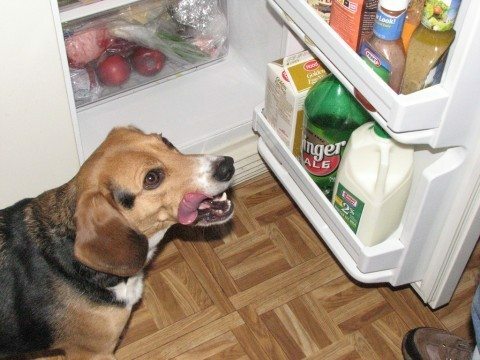 Your dog could react differently to the taste of the food, or he could even have an allergy to one or more of its ingredients. You don’t want this to happen to your dog! Therefore, whenever you are introducing your dog to a new food (or combination of foods, such as those in Kong recipes be sure to test it out while you are home so you can monitor your pet’s reaction. The odds are very small, but there’s always the chance that your dog could be allergic to a particular food, or it just may not sit well with your dog — causing upset stomach, diarrhea or vomiting. Sometimes, even the smallest change in a dog’s diet can cause an adverse reaction. Following are all of the foods and edible items that are potentially dangerous to dogs (along with links to the sources which cite those items as being harmful and why). TIP: At the very least, you should avoid feeding your dog human foods that are salty, sweet (high in sugar content), or fatty. The good news: There are many people foods that are safe for dogs to eat! I encourage you to look at the ingredients that are listed in DIY homemade dog treat recipes as well as homemade Kong stuffing recipes to find some fun combinations of dog-friendly foods that your dog will love. Here’s a good list of plants & herbs that are safe for dogs, plus a list of ones that are not. And here’s a simple list of all-natural ingredients that are safe for dogs. Before you introduce a new food to your dog, there’s one other thing that you should take into consideration: the “begging” factor! In our household, we’ve noticed that our dogs tend to beg for people foods any time they smell something they’re familiar with. On the other hand, if they’ve never tasted it before, then they don’t beg for it. 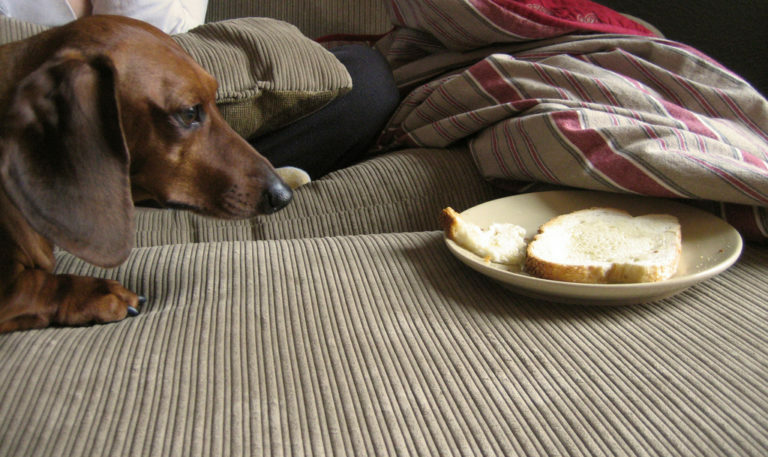 For that reason, we have only introduced 2 human food items to our dogs: peanut butter and bread. They get those on a fairly regular basis as treats — usually mixed in with regular dog kibble in their Kong toys. When it comes to filling Kongs, we layer ingredients inside the Kong toy using various combinations of those 2 human foods and other store-bought dog foods, treats, and Kong-friendly products made specifically for dogs. To give you an example, any time we crack open a jar of peanut butter (…wait, I mean move the peanut butter jar from the pantry to the counter!) or open a loaf of bread, our dogs start salivating and licking their lips in anticipation of getting some. Yet we can hold a big ‘ol steak in front of them, and they don’t blink an eye! So just remember, once you introduce a particular food to your dog, there’s no going back. They’ll always want some of yours whenever you’re eating that food in the future. We’ve also reserved a handful of other human foods for times when our dogs have various ailments (like diarrhea) or need to take pills. Those foods are: rice, cheddar cheese, cottage cheese, and plain yogurt. They make the process of giving pills so much easier. However, yes, our dogs do tend to beg for them now when we’re eating them ourselves. So be careful about which foods you use to associate your dog with a good experience! On a related note, here’s a list of plants that are not safe for dogs, as well as a list of those that are safe.